Tirupathi vada and Laddu are world famous and distintly unique in taste. 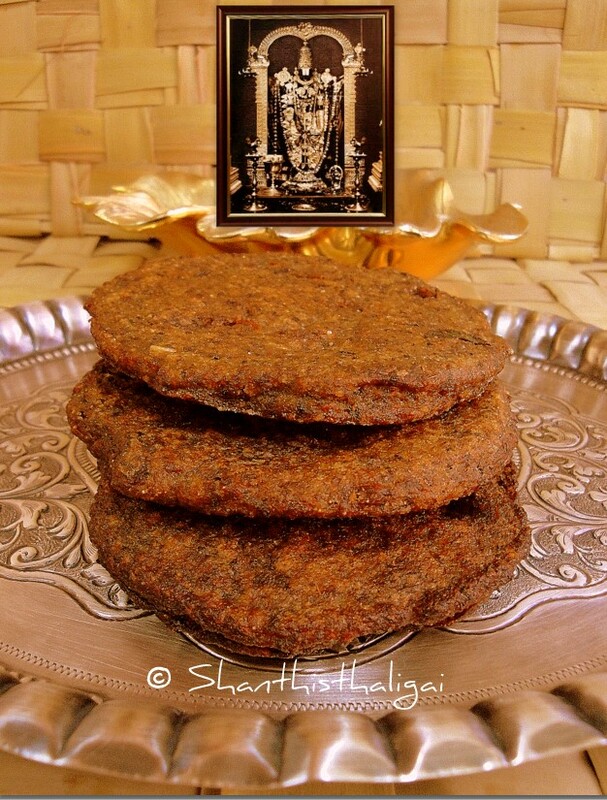 It is called as "Tirumaal Vadai" which is huge in size and distributed as prasadam for "Kalyanotsavam" in Tirumala. 'Tirumaal Vadai' will be flat and little hard, and usually given as prasadam for utsavams only. I have not come across the vadais on the prasadam counters, but have heard that only limited number of vadais are for sale and its difficult to get it. If some friends/relatives do 'Kalyana Utasavam' they give a piece. Though the vadais are hard to bite, one would be tempted to have more bites. That temptation made me to try this 'prasadam' at home. Here is how I made the 'Home-made Tirupathi vadai'. Wash and soak urad dal and rice in water for 1 hour. Chop ginger. Pound pepper jeera using a mortar and pestle to a medium coarse powder. Drain water completely from the soaked dal and grind it alongwith ginger to a medium coarse paste without adding water. The batter should be thick. Add pepper jeera powder, salt and mix well. Heat required ghee/oil . (In Tirumala / Srirangam temples only ghee is used for deep frying). Wet your palms with water, take out a big ball from the batter and flatten it using your hand in a banana leaf or clean moist cloth to slightly thick, palm sized disk. As the size is bigger than the normal vadas, deep fry one at a time. 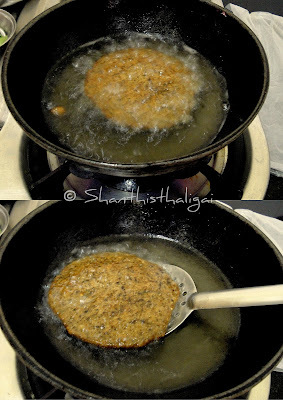 Carefully drop it into the oil, cook on medium heat and turn it on both sides until golden brown and crisp. TIRUMAAL VADAI is ready. As the vadas are thick, it will take a long time to become crisp. You can make thinner vadas also. Wet your hands and banana leaf for each vadai so that the vadai doesn't stick to your hands. Arumai. Did not think it is made with fewer ingredients. Thank you very much for this. Made it this morning and it came out very well, a little smaller sized vadas but the taste was the same and I was so happy I could make it myself and offer this prasadam.